At the renowned Berkeley Bowl whole foods grocery store last week I encountered the Jazz apple. A cross between the Gale and the Braeburn that has out-scored both in tastings, it’s a rich, crispy apple bursting with flavor. It was grown Washington state, but I had to go to California to find it. Go figure. 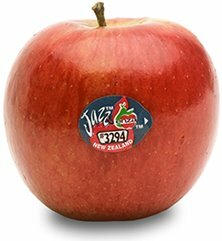 According got the jazzapple.com website, (yes, this is an apple with it’s own website) it’s available in Washington state November through April and New Zealand (where it was developed) June through August. This entry was posted in Uncategorized and tagged Jazz apple, Washington Apple. Bookmark the permalink.